The foyer provides the first impression of your home; it sets the tone for everything. It's also a transitional area -- you've just come indoors (or you're about to go outdoors) so we prefer foyers to be spacious; a room that is a mix of inside and outside features, as well as your personal style. 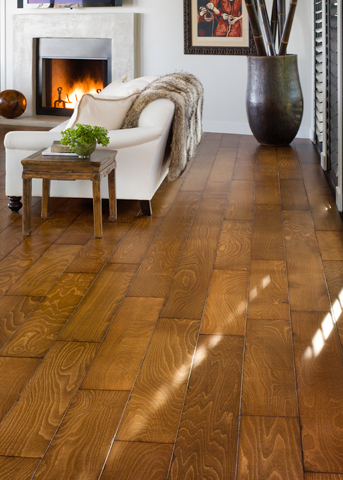 Hardwood flooring for the foyer is a crucial feature for the home that is refined yet welcoming. Is your style sleek, urban and sophisticated? Or do you prefer warm, traditional and inviting? Do you fall somewhere in between? You only get one chance to make a first impression, and the foyer is where your aesthetic makes its grand debut. The halls of your home are high-traffic areas, so it's important that the hallway hardwood flooring can stand up to a lot of punishment. Plank from United Tile floors are coated with aluminum-oxide finish for strength and durability and feature a 50-year finish warranty, so you won't have worry about wear and tear. We typically suggest that more narrow areas of the home -- like a hallway -- be fitted with narrow planks, so they give the impression of a larger space. Larger rooms, conversely, tend to look best with planks large enough to fit the room accordingly. To explore different plank widths, please use our hardwood flooring selection tool.